By making the Coastal Bend Bays & Estuaries Program a recipient of your donor-advised funds, you can directly support the protection and restoration of the bays and estuaries in the Texas Coastal Bend, while also supporting continued economic growth and public use of the bays. 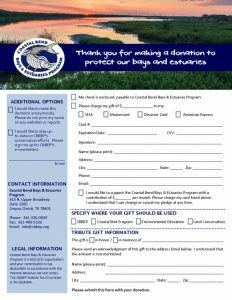 Please consider providing CBBEP a grant from your donor advised fund. You can initiate a grant recommendation from your donor-advised fund directly from our website using the DAF Direct widget below. For more information about directing donor-advised funds to CBBEP, contact Kiersten Stanzel, Director of Partnerships at 361-336-0315 or kstanzel@cbbep.org.